The rex Lab filmed golden and bald eagles at the National Eagle Center, with dual synchronized high-speed, high-definition cameras. Here Kari Mosbacher and Chrissy Burkhart stand next to an inset frame capture of one of the NEC's enormous female bald eagles. 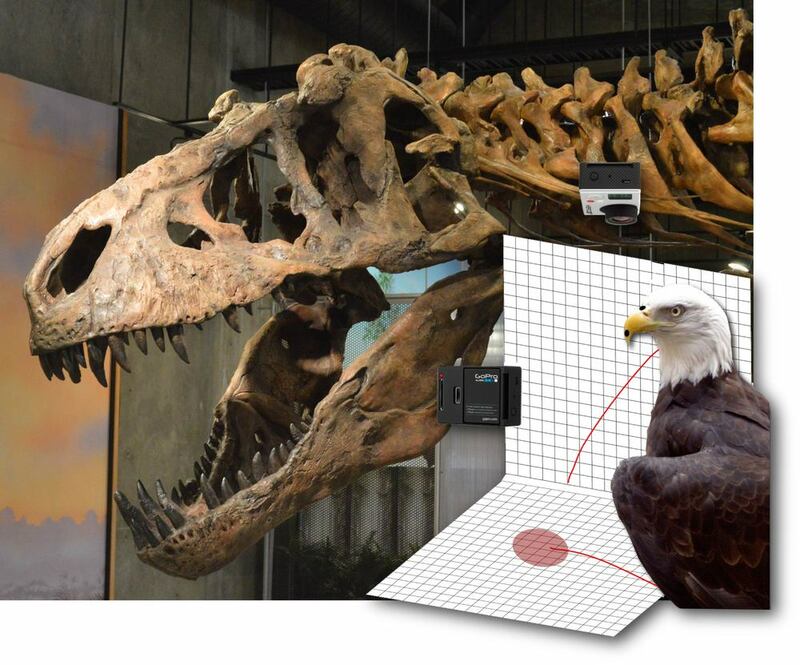 With our physics software, students will track and derive 3D feeding kinematics of the raptors. UW-La Crosse junior Zach Tooley joins the lab to work on the neck and skull anatomy of a Siamese crocodile, in collaboration with Ohio University. Here Zach uses the program OsiriX to isolate the bony elements making up the atlas (first neck vertebra). Zach Tooley shows the bone densities and anatomy of a super-complicated crocodile neck vertebra (the atlas) which attaches to the head. A cast arm of the dinosaur Acrocanthosaurus is in the background. Lauren Schultz, Kari Mosbacher, Cody Fisher, and Mari Sweetman (in order on the pictures below) presented research on correlations of bone density and feeding adaptations in raptors and alligators. Next stage: publication! Lauren Schultz and Kari Mosbacher correlate owl and merlin feeding styles with bone density and stresses. Cody Fisher and Mari Sweetman present the drama of alligator feeding function. Renaissance woman Christina Burkhart won a major stipend for summer research, working with the rex Lab and Prof. Barrett Klein on firefly flight patterns. In experiments entirely of her own design, Chrissy will test her hypotheses about firefly behavior with high-speed video and calculations of digitized flight movement. Chrissy Burkhart (center, with wonderful snake), and advisors Eric Snively and Barrett Klein. Collaboration with Royal Saskatchewan Museum. That was fast. Lab PI Eric Snively visited the T. rex Discovery Centre and RSM Field Station in Eastend, SK, to set up summer collaboration with Curator of Palaeontology Tim Tokaryk. The RSM and rex Lab will use computed tomographic (CT) scanning, and the Canadian Light Source synchrotron (University of Saskatchewan), to investigate bones of adult and juvenile Tyrannosaurus rex. Here are Tim and Eric with Scotty (RSM P2523.8) for scale. Scotty the Tyrannosaurus rex (RSM 2523.8) with Tim (left) and Eric (right), the humans obviously too small to notice. A grant to the rex Lab will jump-start our high-speed video and clever motion tracking of feeding raptors, and enable us to CT scan the neck vertebrae of Scotty the Tyrannosaurus rex (Royal Saskatchewan Museum RSM P2523.8; photo by Meagan Gilbert). The video will document and quantify feeding motions in raptors like this bald eagle, which we will replicate through musculoskeletal computer modelling. What we discover about errors in our models will inform simulated dynamics of bigger theropod dinosaurs, like Allosaurus and Scotty the T. rex. Skull and neck of the Tyrannosaurus rex Scotty (RSM P2523.8; photo by M. Gilbert), and schematic of high-resolution, high-speed video of a feeding bald eagle (Haliaeetus leucocephalus). Paleontologist Tim Tokaryk led Scotty's excavation, and technician Wes Long prepared and cast its bones and reconstructed the skull as seen here. Densities in the skull and beak of a great horned owl (Bubo virginianus), rendered in OsiriX by rex Lab student Lauren Schultz. The lab is studying bone densities and stiffness to hypothesize functions related to feeding, testable through finite element analysis. Red=dense, purple= sparse. Rainbow3 color palette. Smooth opacity table. The specimen was scanned at the University of Calgary xTreme CT, courtesy Steven Boyd and Anthony Russell. 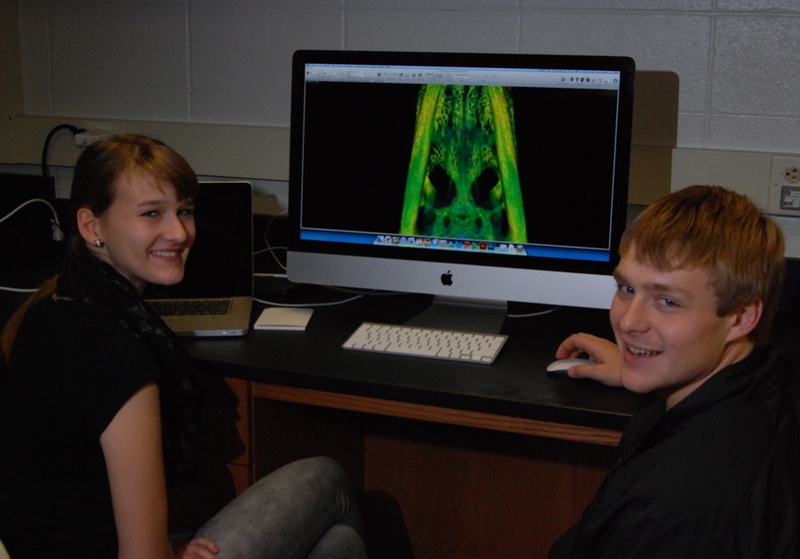 Mari Sweetman and Cody Fisher join the rex Lab to document skull densities in crocodilians. Both are excelling in their first UW-LAX classes; Mari is a high school student getting a jump on university coursework! Karolyn Mosbacher gives us a dorsal view of the cranium of a merlin (Falco columbarius ), with hotter colors representing denser bone. ...while lab veteren Lauren Schultz (right) produces a spectacular anterior CT view of a great horned owl (Bubo virginianus) skull. Kari (left) and Lauren held these expressions for 45 seconds. 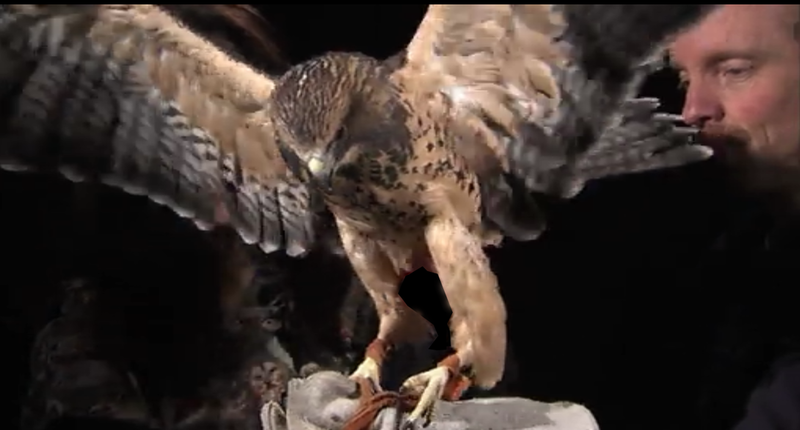 Below is the Swainson's hawk (Buteo swainsoni ) Max, at the Calgary Wildlife Rehabilitation Society in Calgary, Alberta. Max and other raptors at CWRS feature in our latest paper on feeding in modern birds (and larger dinosaurs), accepted by Journal of Zoology. Larry Witmer discusses rex Lab's contributions to fleshing out dinosaurs, with both anatomy and motion, in his talk to Ohio University's Science Cafe. Eloquent (and physical) demonstration of our metaphors for dinosaur feeding. The rex , Cotton, and Witmer labs collaboratively investigate feeding in modern raptors and extinct dinosaurs. The American kestrel here was filmed by co-author Michael Ryan (Cleveland Museum of Natural History), and Allosaurus restored by Ryan Ridgely (Ohio University). UW-La Crosse junior Lauren Schultz has joined the rex Lab to investigate feeding in birds and other dinosaurs. Here, Lauren visualizes regions of particularly dense bone in the skull (minus the sclerotic rings) of a great horned owl, using the CT imaging program OsiriX.